Dodo lets designers and developers do blob detection with Flash and Web cam. 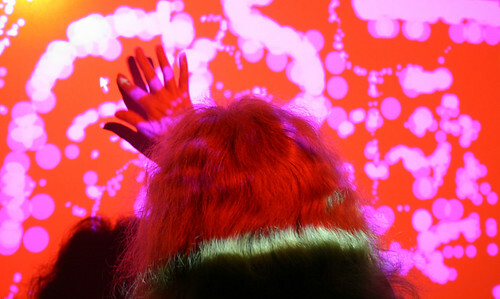 Blobs are areas of movement and can be used for multitouch applications or artistic visualizations. We have added a check to make sure that the DodoCamera is ready before calling DodoBlobs. The samples have been updated as well as the classes. Please grab the new link. We had done this some time ago but must have gotten distracted and missed posting. Still cool to see it work! Just added a missing ExitButton class to the Dodo Zip file – thanks Astra! Dodo lets Flash designers and developers easily detect blobs in a Web cam – for instance, light objects on dark backgrounds as seen above or dark objects on light backgrounds. These can be used for multitouch applications. A multitouch example using Dodo and Goose at http://gooseflash.wordpress.com is provided. Please see the Video link for an introduction video and a look through the code. You can also see sample code behind the Code link. What a magical feeling to move and resize pictures on the screen with a couple flashlights shining through a black plastic duotang cover 😉 All the best in using the code. Any thoughts are welcome. Please add your link at left if you use the code and it would be great if you get around to donating through Karmatja! Dodo, the eighth in a series of advanced interface open source solutions will launch in August after Inventor Dan Zen goes to Hawaii 😉 to recover from the launching of six previous sites available at Flash Feathers – http://flashfeathers.wordpress.com and also linked to at right. So have a look around – we look forward to bringing you Dodo soon!